43% of Americans do some kind of work at home, many of whom work at least two to three days from their home office- that’s a lot of people! So it’s not surprising that more of us want a place at home where we feel comfortable, focused and motivated to get on with the tasks in hand! If you don’t have a space like that at the moment not to worry, we’ll be covering loads of inspirational office decor ideas that’ll help you transform your workspace. There’s nothing better than a gorgeous vintage-style desk to get the creative juices flowing. You can paint an elephant desk in white paint and slot it into one of your larger rooms, and voila you have yourself a gorgeous statement piece as well as a lovely place to work. If you already have a home office, then you might want to consider adding a splash of mint green. This fresh hue perfectly complements traditional style furniture and architecture. Fresh tones are great for helping us stay focused and enthusiastic about our work! If you’re looking to create a glorious concoction of old and new, then you can’t go wrong with adding aluminum accents to your home office. Perhaps a funky stool and desk combination? We’ve also found that chicken-wire bookcases are perfect for adding a touch of rustic charm! If you’re stuck for unique office ideas then why not pick up a vintage-style table, like a sewing bench. Not only is this a quirky addition to your home office, but it also doubles up as a creative space if you’re into home crafts! Or, if you don’t have a spare room to create an office, vintage sewing tables tend to fit alcoves snugly. So it’s an excellent choice for utilizing small spaces! If you’re stuck for inspirational office decor, then you should transform some of your old furniture and make it into something gorgeous! Or, head out to a junk shop or a car-boot fair and pick up a vintage looking desk. It doesn’t matter about the condition of the piece because you’re going to sand it down and paint over it anyway! At the moment, grey is on-trend. So, take a simple desk with a matching armchair and wash it in an elegant shade of grey. This look not only suits home offices, but it would also look fabulous in a living room. For some inspiration for your own home office, be sure to check out Midinmod. If you don’t have a home office not to worry, with some careful planning, the angular alcove under your stairs can quickly become a gorgeous workspace. All you need to do is ensure adequate headroom above your chair, and maximize your storage space. You can fit cupboards to fill the higher spaces of this area, so all of your stuff is within reach! Top Tip: you don’t want this space to become dark and dingy so ensure to factor in plenty of lights. Or, you could consider making your desk the main feature of your workspace. For example, a solid pine desk beautifully contrasts against smooth grey-painted paneling. Then make the most of excess space by adding deep drawers and open shelves under your desk. 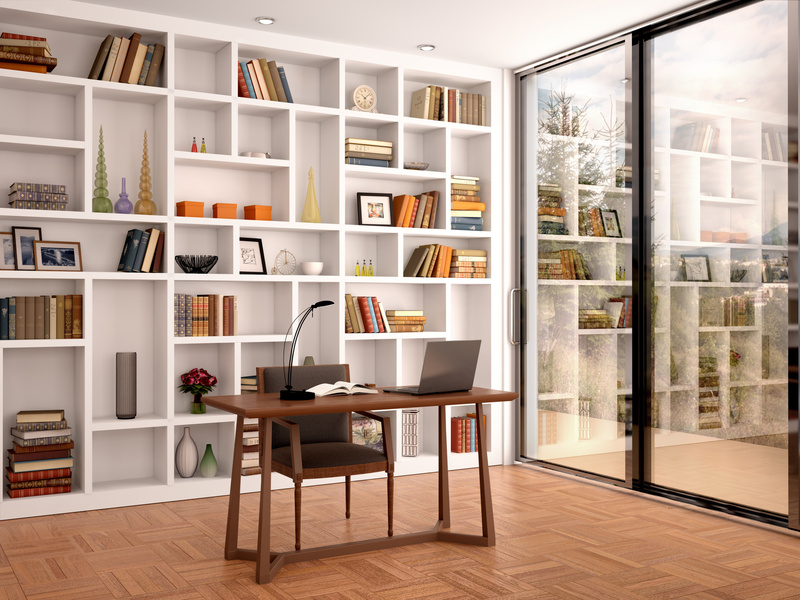 Alternatively, you could extend your workspace even more by putting your desk in front of a built-in shelving unit. Not only is this great for extra storage, but it’ll help keep your desk clear. Comfort is essential when you’re working, so find a chair that supports your body and allows for smooth movement. The longer you’re sat in your chair, the more features you should consider. For example, lumbar support, tilt adjustments, and adjustable height. This is especially important if more than one person uses the office. The last thing you want is aches and strains! Inspirational office decor doesn’t get much better than a ladder style desk. For those of you who don’t know, this kind of counter leans from the top of the wall and comes to the ground (just like a ladder would), and tiers look like steps. You can secure the desk to the wall using fixings at the pigeonhole section, just above the desk worktop. This ideal for accessing your stuff with ease. Or if the theme of your home is sheer elegance, your office shouldn’t be any different. Out of all the styles, a glass-topped desk looks the sleekest, and most modern! Who wouldn’t want to get to work using such a beautiful desk? You need to feel like you’re in control of your own workspace, and the best way to do this is to make sure everything you need is stored within an arm’s reach. You can do this by making sure you have plenty of storage space either in the form of drawers attached to your desk, or desk tidies and trays neatly arranged around the edge of your desktop. Alternatively, if you rather keep your desk clear, you could opt for storage pedestals on either side of your desk and a hanging noticeboard above your desk. Did You Enjoy This Article on Inspirational Office Decor? If you loved these inspirational office decor ideas as much as we do, then we’re confident you’ll enjoy the other posts featured on our ‘work from home’ blog. Over there we discuss everything from starting a business from home to how working remotely affects your health. Enjoy! Alternatively, if you have any questions about this content, please feel free to drop us a line. We’d love to hear from you soon!